The Illumiphone may not look sophisticated but it has a divine sound. Princeton graduate and Software Engineer at Codecademy Bonnie Eisenman was asked to create an electronic music show for a class project. She went a step beyond, creating an electronic music show using a new musical instrument she developed, based on light and spatial movement. Extra credit seeker? The instrument is called the Illumaphone. On the surface, it looks like six coffee cups sitting on top of a cardboard box. 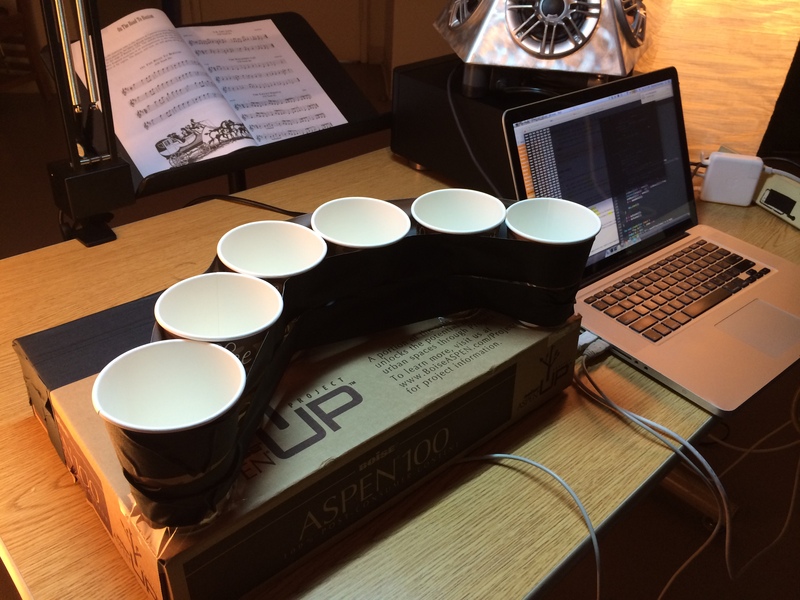 When you wave your hands above one of the coffee cups, a connected computer speaker plays a note. While it looks like magic, it’s a bit more involved than that. The Illumaphone is powered by Arduino Uno, photoresistors and Princeton’s proprietary music software, ChucK. For Eisenman’s model, she took six coffee cups and placed a photoresistor in the bottom of each. When she waved her hand above a cup, the amount of light in the cup changed, triggering a response from the sensor to Arduino, which sent a signal to a connected computer, which was interpreted by the software, releasing a musical reaction in response to the spatial movement. Well, maybe it is magic. Eisenmen gives a detailed description of how she built the instrument and how it functions on her blog. She also uploaded a few videos on YouTube to record the ordeal. No, you don’t always have to invent a new instrument for your class final, but sometimes, it helps. To see Bonnie’s build process for the Illumiphone check out her blog here.